Richard Dawkins in an article to the New Statesman—the same issue which somebody who obviously wasn’t in full possession of his faculties assigned to Dawkins as editor—the Christmas issue, mind—an issue filled with unreason, prejudices, error, unexamined biases, and bizarre beliefs—e.g. Sam Harris pops up to say he has no free will, causing us to wonder if he demanded payment for his article; Michael Moore declares “We are animals” (who knew? ); Daniel Dennett strokes his beard and inveighs against debutante balls (guess who never got asked to the prom)—in this article, I say, Dawkins demonstrates his astonishingly ability to think unclearly, while also convincing those willing and eager to be convinced that what he had to say was worth hearing and probably even true. Dawkins thinks lines are “tyrannical.” Why? Because he very cleverly noticed that some demarcations are capricious, such as voting age limits and college grades. He also discovered some discontinuities are matters of fact, such as admitting a beaver isn’t a coffee cup. He further, and wisely, opined that we shouldn’t reify capricious disjunctions, but we’re stuck with what nature hands us. The only problem, and the reason for this response (besides that he just last week referenced this article), is that after this intellectual burst, Dawkins couldn’t keep straight the very categories he discovered. His irrationality probably entered because of his ulterior motive, his only real impetus, which was to proclaim his happiness with abortion—proving once again that bloodlust in blinding. There are those who cannot distinguish a 16-cell embryo from a baby. They call abortion murder, and feel righteously justified in committing real murder against a doctor — a thinking, feeling, sentient adult, with a loving family to mourn him. The discontinuous mind is blind to intermediates. An embryo is either human or it isn’t. Everything is this or that, yes or no, black or white. But reality isn’t like that. Abortion is murder if the 16-cell embryo is a human being. How many cells does it take before the collection becomes human? Dawkins, a collection of cells, will shortly claim that being human is entirely arbitrary. For now, he jumps into the silly stream. Not all who call abortion murder because it is the killing of an innocent human being “feel righteously justified” in murdering abortion providers (I almost said “doctors”). Just as all those who guest edit issues of New Statesman and who despise religion do not “feel righteously justified” in killing innocent religion providers. But some do. And which side has more blood on its hands? Not for the first time, Dawkins merely assumes what he wants to prove, and says something demonstrably false in the course of doing so. It also does not follow that because an embryo is a human being that “everything” is black or white. Of course it doesn’t. But it also doesn’t follow that everything exists on the continuum, that all lines are subjective. Eagles are not sturgeons: yes is not no: true is not false. But personhood doesn’t spring into existence at any one moment: it matures gradually, and it goes on maturing through childhood and beyond. More bloodlust. Or ignorace. Or both. This statement appears to say that we never quite reach personhood, or that we can be partial people (not in body, but in essence), or that we do reach personshood but only after accumulating sufficient “maturity points” (perhaps doled out by some beneficent government). Human worth, to Dawkins, can be graded on a continuum, a horrifying view, instead of the old-fashioned view that all people have intrinsic value and in that sense are equal in the eyes of God. To the discontinuous mind, an entity either is a person or is not. The discontinuous mind cannot grasp the idea of half a person, or three quarters of a person. To Dawkins, it seems, an entity such as my swift and sleek Dell Inspiron laptop might be characterized as partly a person (it does “mental” calculations); or that he, Dawkins himself, might be considered a shade volcanic (the lava-filled ones, I mean; his temples throb with hot fluid). Or would he snort and go all discontinuous on us in these matters of judgment? Does Dawkins not recognize the difference between metaphor and reality? On the other hand, classicalists really can’t imagine what a three-quarters person is. Somebody missing a leg? Still a person. Somebody with an artificial heart? Still a person. Somebody with a pipe through his skull or strapped to a machine and declared a “vegetable”? Human, and eligible for employment in any university. All of these whole and in-pieces people all retain the essence of being a human, and are therefore people. You won’t be surprised to learn that, to Dawkins, essentialism is “one of the most pernicious ideas in all history.” Sure it is. Look how much it holds fellows like him back. He and his gloomy band of New Statesman, loyal party members all, would delight to roll out the guillotine, at least figuratively, and start eliminating undesirables—improves the race and quells dissent, you see. They’d get away with it, too, if it weren’t for the majority still holding to essentialism and therefore frowning on wanton slaughter for eugenical and political purposes. It is amusing to tease such absolutists by confronting them with a pair of identical twins (they split after fertilisation, of course) and asking which twin got the soul, which twin is the non-person: the zombie. A puerile taunt? Maybe. But it hits home because the belief that it destroys is puerile, and ignorant. This teaching [of human life] remains valid and is further confirmed, if confirmation were needed, by recent findings of human biological science which recognize that in the zygote resulting from fertilization the biological identity of a new human individual is already constituted. Empirical observation has, of course, guided the Church in deciding the question of human life. St Thomas Aquinas, lacking modern medicine, taught that ensoulment began some period after conception. It was the best he could do; now we know better. Plus, abortion was always said to be a moral evil and since the soul is the form of a human, identical twins pose no difficulty. “It would never be made human if it were not human already.” Really? Are you serious? Nothing can become something if it is not that something already? Is an acorn an oak tree? Is a hurricane the barely perceptible zephyr that seeds it? Would you apply your doctrine to evolution too? Do you suppose there was a moment in evolutionary history when a non-person gave birth to the first person? Yes, an acorn is, in essence, an oak tree. It is also an acorn. It is not a 1971 Mustang with “three on the tree”, nor is it a cheesecake nor a leopard. It is both an acorn and an oak tree, albeit a small, packed-up version of one. Just as the oak tree is still an acorn, but now fully grown. The caterpillar is the butterfly, and vicey versey. Notice that the man can’t keep straight what he’s criticizing. A hurricane is neither puff nor zephyr: a hurricane is an organized system with winds exceeding an arbitrary level set by meteorologists. But breezes and gales are both wind, just as essentialism says. And, yes, there must have been a moment in evolutionary history when a non-person gave birth to the first person; accepting, arguendo, evolution was responsible for producing the first human. See Mike Flynn’s instructive Adam & Eve & Ted & Alice. Why couldn’t evolution have done this? Dawkins only retort is that it’s not possible, again assuming what he’s hoping to prove. When you drive in a circle, you get nowhere. A question: is similar logically equivalent to the same or identical? I’m just asking. From this quote we conclude that one should not guest edit magazines before dinner. Frames your thinking in terms of food, which might prove embarrassing. How often have you heard anybody speaking with relish of the relish he’d serve with his relative? He speaks of a “connection” as it were a stout rope which if pulled upon at the base (by suitably equipped proto-slime) would jerk us back a few notches. Or something. Surely he realizes there is more than meat separating “Devonian fish” and humans. They weren’t rational: we are. Rationality is the essence of being human, as Aristotle taught us. So it makes no sense to harp about eating each other or breeding with Jurassic Park recreations of species that came before humans, as Dawkins recommends as a desirable thought experiment. Ability to interbreed might be what biologists call a “species”, but that is neither here nor there for what is a human. And isn’t the doctrine of species, Richard, an arbitrary line? Are mules horses or are they donkeys? Or are they mules? Who knows how he would answer, because no sooner has he declared for species, he declares against them, citing variously shaded gulls and their ability to interbreed or not. “Are they distinct species or not? Only those tyrannised by the discontinuous mind feel obliged to answer that question.” I don’t feel obliged, so I gather I’m not tyrannized. He doesn’t recognize that the problem is with the definition of species: if it doesn’t include essences, it is incomplete. A mule is essentially different than either of its parents, even though, I guess, it isn’t a “species” of anything since it can’t reproduce. Yet a mule may still be known by its essence. I didn’t follow the rest of his article too well. Seems he was still angry with George Bush about something. Second: The lines in evolution are not “unbroken”. There are a lot of breaks. And with the ESA declaring a wolf in Yellowstone endangered and one in Alaska not, the entire argument about “similar” is either grounds for removing the ESA or completely off base. Lastly, with abortion, people want this both ways. My best guess is one becomes “human” when one becomes a liberal (since wishing death and torture and maiming on conservatives is approved off and they are often referred to a inhuman–or was that inhumane?). Prior to that, a fetus is human if we are talking a wanted pregnancy–a miscarriage is cause for mourning. If it’s unwanted, it’s a lump of cells. Fetus’s are human if we can add an extra charge of homicide in the death of a pregnant woman. Otherwise, they are lumps of cells. As far as society is concerned, humanity is conveyed by circumstances and who is “king of mountain” at the moment. Society does not endow people with title of special being–only religion does that. As far as a fetus being human or not, Plato said that the soul exists before the body and so a knowledge of God is innate. I believe that with all my heart…and soul. Great post Dr. Briggs. You are correct in essence; Dawkins wears his biases on his sleeve. I think he might have had a point or two to make if he hadn’t chosen his examples so as to portray an agenda, or was it posturing. If he is really going to enter the field of philosophy or religion he should definitely read up on the subject and toss the straw men. Even I with my limited knowledge in the field try to be more circumspect. I must challenge you on one point Briggs. The opening quip (picture) is not correct. 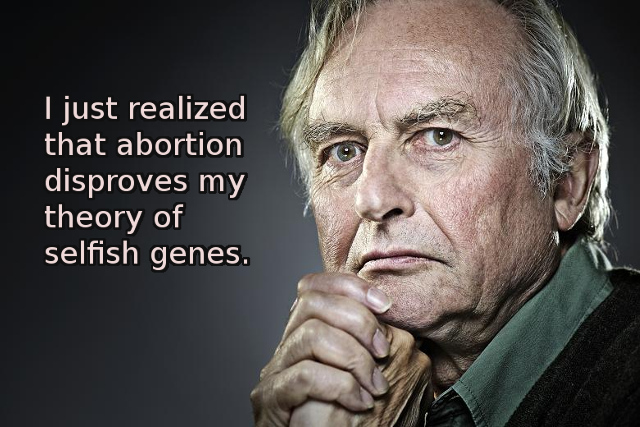 Abortion does not disprove the selfish gene idea any more than it does any other theory of evolutionary selection. Those who do not abort their children will be more successful than those who do. The Spartans had a reputation for being the masters at a post birth version of this. Brutal, certainly, but that is a separate point. Question Dawkins on his religious tirades by all means, but his biological insights are worth reading. He should stick to that but then he might say that you should stick to statistics. I don’t say that of course as I enjoy these forays to topics unknown. There be monsters! The discontinuous mind cannot grasp the idea of half a person, or three quarters of a person. I realize that Dawkins is a Brit (and therefore according to Nietzsche a ‘flathead’) but is he totally oblivious to who were regarded as three-quarters of a person in the original issue of the US Constitution? Presumably in reference to his made up just-so stories and assertions (not proofs, mind you; not carefully considered pieces of evidence; but assertions) about this or that long-distant — and, conveniently, unverifiable — event that supposedly brought us to where we are today or caused us to be what we are. Then we have various assurances that “selfish genes” caused x. Except of course when they didn’t. Or when they caused exactly the opposite. Sorry, but his biological insights are hardly better than his religious ones. Briggs, thanks again for showing how Christianity (and especially Catholicism) enfeebles the mind. Stana, You’ve awakened the Kraken. Flee while there is still time. I’ll add you to my list of prayers, Stana. Chief among my requests will be that you will develop the ability to articulate an argument. Thanks, Scotian. I’m acquainted with it, and many of his other writings. Precisely why I expressed my lack of being impressed. So, what might happen is that a single soul IS delivered to the fertilized egg …and, through God’s higher-than-ours ways, the soul some how divides like the physical cell. Just a possibility. Abortion is largely accepted even for reasons that do not have anything to do with the fetus’ health. By showing that (1) both fetuses and newborns do not have the same moral status as actual persons, (2) the fact that both are potential persons is morally irrelevant and (3) adoption is not always in the best interest of actual people, the authors argue that what we call â€˜after-birth abortionâ€™ (killing a newborn) should be permissible in all the cases where abortion is, including cases where the newborn is not disabled. Suppose a cell had the form of a sphere. Now suppose that cell split into two cells. Which one gets the sphere? Which one is a formless blob? YOS, I think you mean 3/5 and not 3/4, but you point is the same. Dawkins’ gotcha attempt is childish however, since God would certainly be capable of providing as many souls as necessary. Unrepentant sinner that I am, this reminds me of the “teeth will be provided” hoax. Only the pro-abortion viewpoint requires a line to be drawn. If your position is that killing fetuses is OK, but killing humans (presumably) is not OK, then some arbitrary line will have to be drawn to reconcile your two viewpoints, whether that arbitrary discontinuity is at conception, 3 months, birth, or 1 year old. If on the other hand your position is that killing neither humans nor fetuses is OK, then no line needs to be drawn. Dawkin’s exercise in logical masturbation is nonetheless impressive. Personally, I think we should start talking about the selfish mitochondrion (or maybe the selfish Golgi Body or something, but today I like mitochondria). After all, everyone knows that the mitochondrion produces energy for the organism, but why does it do that. My theory is that the real reason the mitochondrion generates energy for the organism is that it wants to create more copies of itself and be passed down from generation to generation. The organism is actually a slave to the mitochondria within it. The organism just serves as a host for the perpetuation of the mitochondria. There, that is just as “scientific” as Dawkins’ selfish gene idea. Gee, maybe I can write a book and go on a speaking tour to make lots of $ off of my unscientific idea! Much of what Dawkins writes not only is not good biology it is not even rational. Worse, rather than being just unscientific, much of it is what I might call “anti-science” or “anti-knowledge.” Not only does a person not learn anything of value from it, a person is actually worse off intellectually for having been exposed to it. An ironic example of Dawkins’ virus-like intellectual memes infecting a new victim, much to the victim’s detriment. In evolutionary biology Mayr was head and shoulders above Dawkins or Gould. Go into any room and ask all those who have heard of Richard Dawkins to raise their hand, then repeat for Mayr. I have read Mayr’s popular book, which is pretty good. Nevertheless, there are still troubles for natural selection for human behavior. And, no, I do not mean the “intelligent design” young-earth business. Abortion, adoption, priests, euthanasia, and on an on, none of which are good for survival, but which persist. These are only problems if you think that natural selection produces perfection or that human evolution stopped in the distant past. New problems created by advances in technology will introduce evolutionary pressures of their own. All these types of objections have been extensively discussed by biologists, Darwin and Mayr in particular. If I may be so bold, I think that you may be making the same mistake that you accuse amateur philosophers of making – that is you need to be more familiar with what has already been done. Nope. In fact, some heavy brains have voiced some damning criticisms of “evolutionary psychology” and the like. Criticisms which are well known among philosophers, for example, but not so much by the public. Take Darwinian Fairytales: Selfish Genes, Errors of Heredity and Other Fables of Evolution by David Stove, The Solitary Self: Darwin and the Selfish Gene, Evolution as a Religion: Strange Hopes and Stranger Fears, and Science as Salvation: A Modern Myth and its Meaning by Mary Midgley, The Devil’s Delusion: Atheism and its Scientific Pretensions and The Deniable Darwin and Other Essays by David Berlinski, Mind and Cosmos: Why the Materialist Neo-Darwinian Conception of Nature Is Almost Certainly False by Thomas Nagel, among many, many others. I chose these (quickly) because all of these authors also are or were professed atheists (Stove is deceased). As you know, I have never been impressed by Stove. The Uncle Fred update is just incoherent, or maybe disingenuous. There always seems to be a touch of the intelligent design about the critics of Darwin, although this is rarely explicitly stated. There is also the tendency to use the abuses of modern psychology as a backdoor criticism of evolutionary biology and through out there is always a barely concealed hatred (not too strong a word) of all things evolutionary that gives the game away. You find more honest debates of the validity of any particular attempt to explain human behavior among scientists themselves. I would be more impressed if these critics started out with the admission that human behavior must have an evolutionary cause, just as is the case for dogs, and then proceeded to criticize a particular attempt to quantify it. But this is rarely the case. The hatred is too strong. Have a read of the books and then criticize each argument as presented and we’ll see how impressive Stove and the others are. Guest posts are always welcome. “Guest posts are always welcome.” Does it have to involve ponies? Might increase my female readership. You do lack female readership, don’t you? I can’t understand why, either, me being such a manly man. I rely on you—and Scotian’s ponies—to get the word out! It’s because “math is soooo hard”! Maybe the ponies will help. Unicorns would be better! So you see, I might consider a quest post as long as I don’t have to write about ponies. Also could you ask your readers to be less critical than normal as I don’t think that my facile ego could stand the rejection? Addendum: Although my ego is also facile, it was the fragility that is my primary concern. Technically, “none of which are good for reproductive success. New problems created by advances in technology will introduce evolutionary pressures of their own. The very essence of Lamarckism. What the organism is trying to do determines what traits or behaviors constitute “fitness.” A change in the animal’s behavior thus induces a change in what is selected. This may be the case among self-conscious animals more so than vice versa. But my favorite part was when he supposedly showed how undirected natural selection produced METHINKS IT IS LIKE A WEASEL from an original string of random letters. Yet, his selection was teleological: any random mutation that resulted in the appropriate letter from the target string was fixed in place. But natural selection supposedly does not have a “target.” And he proceeded by exercising his own intentions outside the letter-string, the essence of intelligent direction! What are the evolutionary pressures that cause dogs to jump up an down when they hear the car keys jingle? Have jingling car keys been around long enough to be a criterion for selection? Dogs who get excited by jingling car keys and run to the car are more successful reproductively than those who do not? Another possibility of course is that the higher animals at least possess memory and imagination and are capable of learned behavior. YOS, one of your more opaque posts. “The very essence of Lamarckism. ” ?? Advances in birth control has an enormous influence on who has children. There is nothing Lamarckian about it. If I remember my reading of Mayr, he rarely mentioned either Gould or Eldrege. On the one occasion that I recall it was not to disparage punctuated equilibrium but to claim that it was derivative. What is really strange is that Gould never, to my memory, mentions Mayr despite his enormous influence on the field. Dawkins is guilty of that as well. Dawkins states in a preface that he should have called the book the immortal gene, since too many readers are hung up on the literal meaning of selfish. “Dogs who get excited by jingling car keys and run to the car are more successful reproductively than those who do not?” Of course they are since they have been breed for just this kind of human pleasing behaviour. The capacity for learning is not an alternative explanation. It is just another way of saying the same thing. Also remember that wolves don’t engage in these behaviours despite being smarter than domesticated dogs. Some people even say that the early stages of wolf domestication happened without directed breeding as wolves learned the advantages of hanging around human camp fires. Others even say that the domestication was two way and that people with dogs were more successful than those without. The survival comment was Briggs. Surely. Lamarck said that what a creature was trying to do determined how it evolved. We may suppose that this is mediated by Blythe’s natural selection in that what a creature is trying to do sets the “parameters” by which selection operates. That is, if a bird is making its living cracking nuts, selection will favor one sort of beak. If it is trying to eat seeds, then another sort of beak. A change in behavior necessitated by some environmental change leads to selection favoring another sort of beak. Your comment “New problems created by advances in technology will introduce evolutionary pressures of their own” is the same sort of Lamarckian thing. â€œDogs who get excited by jingling car keys and run to the car are more successful reproductively than those who do not?â€ Of course they are since they have been breed for just this kind of human pleasing behaviour. Car keys have not been around long enough to exert reproductive pressures. How do you breed for a human-pleasing behavior in advance of that which pleases the human? (In fact, it can be annoying if someone is driving to work or to the supermarket.) See below. The capacity for learning is not an alternative explanation. It is just another way of saying the same thing. The evolutionary origin of a capacity is not the evolutionary origin of a particular exercise of that capacity. We evolved as bipedal creatures, not as ballet dancers. Yet, the neo-Social Darwinists would have it that the particular behaviors are evolved — and will tell plausible-sounding adaptationist stories about why survivors survive. A “capacity” is after all, an Aristotelian potency, and it must be actualized. Dawkins habitually makes so many assertions which are totally contrary to the rules of logic and science. Yet so many people ignore this and prioclaim him as some sort of brilliant scientist and logician, merely becasue they emotionally agree with his opening and unchangeable premise, that there is no God. I’m always bemused by the argument that it’s OK to kill a human embryo because very young human embryos sometimes divide into two embryos. All this means is that human beings are, under certain circumstances very early in their human lives, capable of a-sexual reproduction. Which should hardly surprise anyone who knows that this was the first form of reproduction to evolve. It certainly doesn’t make an embryo less than human, any more than the fact that a human embryo or fetus does not breathe air. Your key comment seems to miss the mark (marck?) entirely. It is much too concrete and is like wondering why a dog will fetch a plastic stick since plastic is a modern development. The dog doesn’t know that they are keys and is just responding to auditory cues. There has certainly been enough time to select for that. I don’t know who the neo-Social Darwinists are. Is this another null set? Ronk “Dawkins habitually makes so many assertions which are totally contrary to the rules of logic and science.” Possibly he does but it would be more convincing if you gave an example. I’m also curious about the embryo example. Is this argument ever actually made? Let’s assume that fetuses are partial people and see where that gets us. If a fetus is 1/3 of a person, then an abortionist who has done three or more abortions can be considered a murderer. That might not be what Dawkins wanted.